The discovery of a bright spot on Ceres has given rise to lots of speculation. And now we've learned something new: it has a friend. The second spot is not quite as bright, but still weirdly reflective compared to the rest of the dwarf planet. The geological mystery keeps getting more interesting! The latest round of photographs was taken by Dawn on February 19, 2015 when the spacecraft was still 46,000 kilometers away (29,000 miles) from the dwarf planet. It reveals not just the bright spot that has been provoking speculation for years, but now our imaging resolution is getting good enough to spot a second smaller and dimmer bright spot apparently in the same basin as the main attraction. 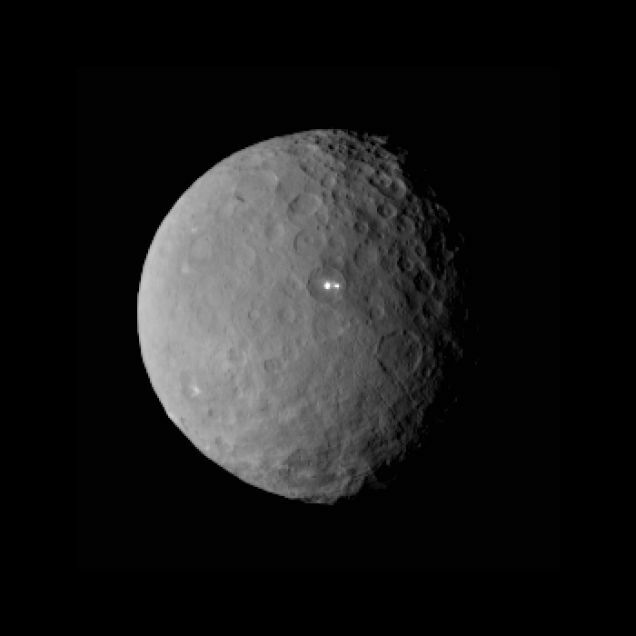 "Ceres' bright spot can now be seen to have a companion of lesser brightness, but apparently in the same basin. This may be pointing to a volcano-like origin of the spots, but we will have to wait for better resolution before we can make such geologic interpretations." Even though the resolution is finally good enough that we can identify a smaller, dimmer companion-spot, we still can't see well enough to make solid interpretations. When speculating wildly about the source of these white freckles, we thought they could be evidence of cyrovolcanism or even icy geysers, but were confused how such an isolated, small world could be thermodynamically active enough to generate either of them. Even though that's the current best-guess, the mystery of how it could even happen still stands. The competing theory that Ceres has an icy crust dulled by dust but exposed in impact craters is still in play, and will be until we can see these mysterious features in enough detail to get an actual shape. I admit it: I'm totally jazzed that we've got such a blatant mystery staring right at us, daring us to figure it out with ever more obvious clues!